For the peace of mind of a hygienic wash. Every day you can come into contact with germs when in crowded environments, in public places or in the presence of pets. A regular detergent cleans but does not disinfect. Napisan works by releasing active oxygen to remove stains. Items washed with Napisan will not only be clean but Napisan also kills the germs you can't see to leave your garments more hygienic. Add two tablespoons (approx. 35 g) of Napisan to your normal detergent in the main wash compartment. For heavy stains, double the dose. Add two tablespoons (approx. 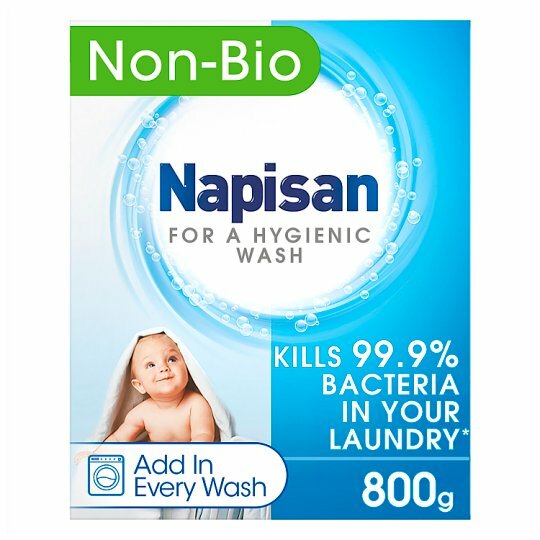 35g) of Napisan into 5 litres of water. Soak for 2 hours and then rinse. Do not use Napisan on silks, woollen or non-colourfast items. DANGER Danger Contains Sodium Percarbonate, Sodium Alkyl benzenesulphonate, and Sodium Silicate. Causes serious eye damage. Keep out of reach of children. Do not get in eyes. If medical advice is needed, have product container or label at hand. Wash hands thoroughly after handling. Wear protective gloves / eye protection /face protection. IF IN EYES: Rinse continuously with water for several minutes. Remove contact lenses if present and easy to do. Continue rinsing. Immediately call a doctor. For sensitive skin, the use of gloves is recommended. Once mixed, do not leave solution in a sealed container. It will continue to give off oxygen and the container may build up pressure and may leak.